An Engine is a Device which transforms one form of energy into another form of Energy. In the previous article, we have discussed the classification of the Heat Engines, and the list of the basic engine components. Now we are going to discuss the nomenclature used in the Internal combustion engines. 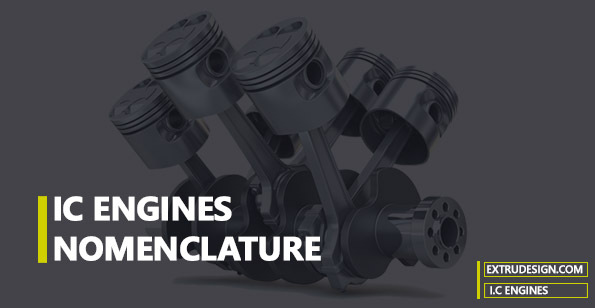 The following terms/Nomenclature associated with an engine are explained for the better understanding of the working principle of the Internal Combustion engines. The extreme position of the piston at the top of the cylinder of the vertical engine is called the top dead centre (TDC). The extreme position of the piston at the bottom of the cylinder of the vertical engine called bottom dead centre (BDC). The maximum distance travelled by the piston in the cylinder in one direction is known as stroke. In other words, The distance travelled by the piston from TDC to BDC is called the stroke. The volume contained in the cylinder above the top of the piston, when the piston is at the top dead centre is called the clearance volume. Swept volume is the volume covered by the piston while moving from TDC to BDC. In other words, The volume swept by the piston during one stroke is called the swept volume or piston displacement. Compression ratio is a ratio of the volume when the piston is at the bottom dead centre to the volume when the piston is at top dead centre. usually, the compression ratio will vary from 5: 1 to 10: 1 for petrol engines and from 12:1 to 22: 1 for diesel engines. This is the Average pressure acting on the piston during the thermodynamic processes. The Bore, Piston Area, Stroke, Top Dead Center, Bottom Dead Center, Clearance Volume, Swept Volume, Compression Ratio and Mean Effective Pressure are the different terminology used in the Internal combustion Engines, we have described these with the units used for them. Please leave your thought in the comment section below.